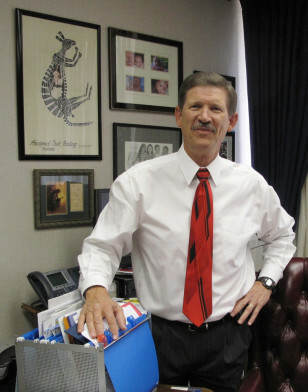 Fresno County School Superintendent Larry Powell poses in his office, in Fresno, Calif. Powell is forgoing $800,000 in compensation over the next three years of his term. Until his term expires in 2015, Powell will run 325 schools and 35 school districts with 195,000 students, all for less than a starting California teacher earns. As he prepares for retirement, he wants to ensure that his pet projects survive California budget cuts.